It’s School Choice Week this week! Join us as we celebrate school choice in Iowa and across the country! Iowa is blessed to have limited public school choice, the Educational Opportunities ACT (STO Tax Credit), homeschool freedom, at personal tuition tax credit, and more on the way! 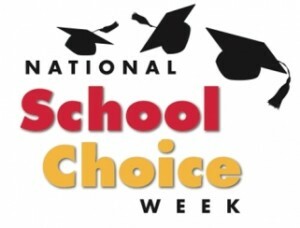 You can learn more about School Choice Week by visiting their website. There are events throughout Iowa. Also, please join our email list and we’ll keep you in the loop on the latest school choice news in Iowa! The Iowa Association of Christian Schools was proud to have representation at the this year’s signing of the School Choice Week Proclamation. Proclamations are a way for Governors to honor and/or celebrate issues or events and distribute important information and concepts to Iowans. The last couple of years have seen School Choice Week and Catholic Schools Week fall on the same week. This signing ceremony saw the signing of both proclamations. We had students and staff from Des Moines Christian School and Iowa Christian Academy as well as representation from the Iowa Alliance for Choice in Education and its sister organization, Iowa Advocates for Choice in Education. Thank you, Governor Branstad, for recognizing the importance of school choice in Iowa and helping us celebrate the accomplishments to this point in giving parents and students more options in education. We firmly believe that a child’s education should never be limited by their income or zip code of residence. We are looking forward to working with Governor Branstad and leaders from both parties on advancing school choice in Iowa. You can read Iowa School Choice Week ’14.